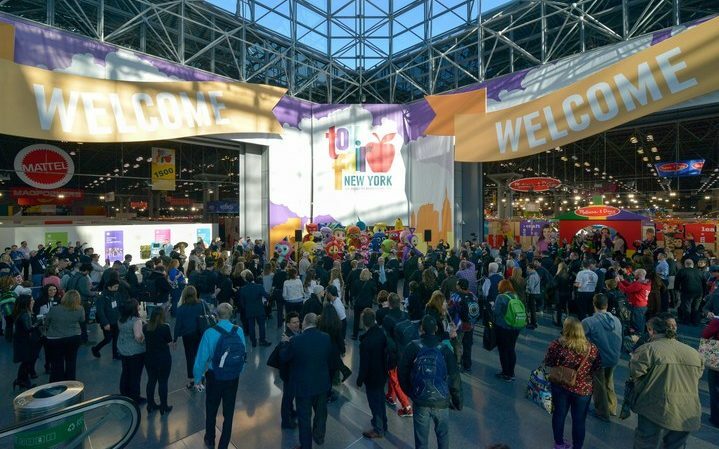 Augmented reality (AR) and virtual reality (VR) are being incorporated into an increasingly larger number of toys and other products targeted at kids, and that was made abundantly clear at the annual Toy Fair in New York City, Feb. 18-21. The incorporation of AR, VR and other technology components into toys was included by the Toy Industry Association (TIA) in its list of the top toy trends for 2017. These technologies were just emerging a few years ago, but have become much more affordable for manufacturers to make available in toys at realistic consumer price points now, TIA spokeswoman Kristin Morency Goldman said at a Toy Fair news briefing Feb. 19. She pointed to the new SpinTales products from TILT by Welspun as one example of how AR is being incorporated into new products for kids. That company’s initial two SpinTales products are the Enchanted Duvet and Jungle Rug that work in conjunction with a free Android and iOS mobile device app. Each product features three interactive stories. When the user points a mobile device (preferably a tablet) showing the app’s featured markers at illustrations on the duvet or rug, characters from the stories appear on the device via AR. Welspun is a Mumbai, India-based textile company that secured a U.S. patent for an “interactive textile article and augmented reality system” that covers the TILT products. Each of the initial SKUs is being sold for $99.99 at the company’s own web site, as well as at Amazon.com and Toysrus.com. The product line has been doing “pretty well” since launching in November, so the company is now looking to expand distribution of the products to other online retailers, as well as brick-and-mortar stores, in the U.S. and other countries, Sanjiv Pillai, deputy general manager of business development at TILT Textiles, told the Media & Entertainment Services Alliance (MESA) at Toy Fair. One additional SpinTales product SKU, also featuring three interactive stories, is already planned, he said. Toy companies, meanwhile, are also “successfully leveraging technology to enhance traditional play patterns rather than replace them,” TIA said in its news release. That was something that most of the companies fielding AR products at Toy Fair told us. AliveLab is a U.K. company that was started in 2015 by James Murden and Sharon Wyness to take advantage of growing interest in AR. The initial products in the company’s Mardles line were AR stickers ($7.99 a book) and it’s expanded the line since then to also include AR coloring books ($9.99 each) and now storybooks and masks that will ship in June at $8.99 and $4.99 each, respectively, Murden told us at Toy Fair. The product line includes a large number of SKUs: 20 masks, 4 coloring books, 3 sticker books and 5 storybooks, he said, pointing out the company had sold 6 million stickers since they launched in summer 2015. The company’s products are compatible with Android, iOS and Amazon Fire mobile devices, and once downloaded, the apps can be used without the user needing to be online, he told us. That means kids can use the apps wherever they are, even when there’s no Wi-Fi. “Everything we do will always be augmented reality,” Murden said, telling us the company decided to focus on that technology right out of the gate because “we felt there was a trend coming” supporting AR. Kids want to interact with their toys and stories, and seeing digital characters in a real environment is just something that “they love,” he said, adding that “Pokemon Go” has “raised awareness” of what AR is since AliveLab started. On the other hand, AliveLab has no plans to introduce products that would require VR headsets, he said, telling us he believed kids should never be so close to a screen as is required by those devices. There is, however, a VR mode in the company’s coloring books where users can use the mobile device screen without a headset in much the same way that one would use VR goggles, and even spin around 360 degrees to see the digital world of the app, he showed us. 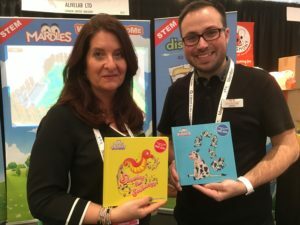 Toy Fair was the company’s first trade show and AliveLab was using it to help promote its product line for the U.S. market, he said. After shipping Merge VR Goggles for kids in late 2015, Merge has now introduced a holographic toy featuring AR that was designed to be used in conjunction with the company’s soft headset or any other VR goggles that feature AR capability. HoloCube by Merge is a cube that the user holds in the palm of his or her hand while wearing VR goggles. Hologram images are created on the cube that the user interacts with by turning the cube. HoloCube was introduced at the Consumer Electronics Show in January and will ship this summer, Merge EVP Dan Worden told us at Toy Fair, adding the company was “in discussions now” with retailers. Pricing hasn’t been finalized, but is expected to be under $20, he said. Like the company’s VR viewer ($59.99 now after dropping from $79.99), HoloCube is compatible with Android and iOS mobile devices. 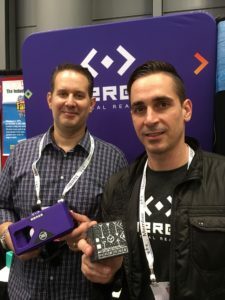 The company is developing two or three apps for the HoloCube and is “very interested in talking to other developers” for additional apps that can be used with it, he also told us. The San Antonio, Texas-based startup was created in 2013 and its first retail account when the VR Goggles launched in late 2015 was Game in the U.K., followed by Amazon, he said. Since then, it’s added retailers including Best Buy, GameStop and Target, and it’s now available at about 3,200 stores in 13 countries including the U.S., he said. Sales surged in 2016 and there were sellouts during the past holiday season, he told us, noting that there’s been increased awareness of VR since its product launched thanks to the arrival of products including PlayStation VR. Shanghai, China-based Pai Technology introduced its first product using AR in late 2016, according to Sherry Wu, director of global business strategy. Cube-tastic! is a puzzle cube game that shipped late last year and comes packaged with a plastic cube similar to Rubik’s Cube that works in conjunction with a free Android and iOS app at $19.99. It teaches the user how to solve the puzzle and then explains the logic behind how it’s solved. Pai, which opened a Santa Monica, California, office in June as part of its expansion into the U.S. market, didn’t heavily promote the product because it’s “trying to test the water” first, Wu told us. Pai then introduced Ocean Pets early this year at $29.99. It’s a playset in which the user creates his or her own fish using the included molding putty and then uses an Android or iOS mobile device and free app that brings the fish to life using AR. 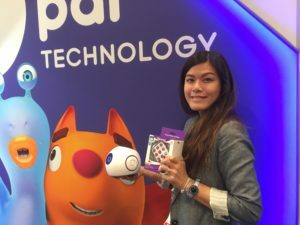 Up next for Pai are three interactive Pai Storybooks using AR that will ship soon at $14.99 each and PaiKodee, a robot for kids that uses AR and, through coding, allows users to control its movements. The robot will ship in May at $199.99, Wu said, adding the app she demonstrated at Toy Fair was just a prototype and wasn’t finalized yet. Like the other Pai AR products, the robot is compatible with Android and iOS mobile devices, she said. Also planned is a language teaching toy using AR for later this year, she told us. Wu also showed us a prototype of Pai Bloks, another AR product featuring coding that probably won’t ship until 2018, she said. There are no current plans by the company to make a VR product, she said, telling us “we don’t know if it’s right for the kids at this point” – although Pai isn’t ruling it out for the future. Seedling has focused on traditional creative play products, but entered the VR category last year with the $59.99 Maze by Seedling, its first product to incorporate digital play. It includes a physical marble maze and cardboard VR goggles for Android and iOS smartphones, and works in conjunction with a free Android and iOS app that allows players to create their own mazes. The company is also fielding do-it-yourself (DIY) Virtual Reality Viewers and DIY headphones at $29.99 each that can be used with Maze. Users can decide how they want to decorate the accessories. 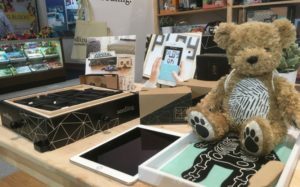 Maze sold “extremely well” at retailers including Barnes & Noble and Nordstrom, and Seedling is now moving on to its first AR product, Parker – a plush stuffed bear that works in conjunction with an Android and iOS app to provide AR functionality, Rachel Rutherford, Seedling chief product officer, told us at Toy Fair. It will ship in September at $59.99, she said, noting that while Maze is targeted at kids 8 and older, Parker is designed for 3-6-year-old kids. The company will also offer bedtime and dress-up/doctor check-up kits at $39.99 each that work in conjunction with Parker, she told us. One AR feature she demonstrated was the ability for kids to hold a mobile device over Parker and be able to see that the sleeping bear is dreaming about sheep jumping over fences. Users will also be able to generate their own content that can be used with the app, she said. Parker was designed so that there are still classic play opportunities for the child using it, she said, pointing out “parents do want to limit screen time” for their young kids. AR is being used by Seedling as just “another tool in the creative toolbox,” she said. It’s the perfect time to come out with an AR product because awareness of the technology is high thanks to “Pokemon Go” and even the technology’s use in Snapchat, she added. Consumer electronics company Sakar already shipped VR headsets under its Vivitar brand name for adults. But the company has now added VR headsets for kids to its product line under the new Discovery-branded line of youth electronics. Sakar previewed several of those VR headsets at Toy Fair, saying they will retail from $14.99-$59.99 when they reach retailers’ shelves this spring. The Discovery line “allows us to expand our portfolio” of brands and products “while promoting smart fun and the development of children’s education and encouraging new ways of thinking and viewing their environment,” Liza Abrams, Sakar SVP of licensing, said in a news release. The VR headsets can be used in conjunction with Discovery’s selection of 360 apps, she said. The Discovery Virtual Reality Headsets enable a 3D video experience drawing inspiration from Discovery VR content and allow a smartphone inserted inside a headset to become a 360-degree VR viewer, Sakar said. Also shown at the Sakar booth was an Mc2-branded VR headset. But product details weren’t provided by our deadline. Toy company Tomy’s first AR products is Lightseekers, an action adventure role-playing game developed for mobile devices that fuses fantasy and reality through technology that’s embedded within accompanying action figures. The technology enables the smart action toys to act as game controllers. Lightseekers is powered by a proprietary technology platform that Tomy said integrates video games and smart action figures with AR and artificial intelligence. 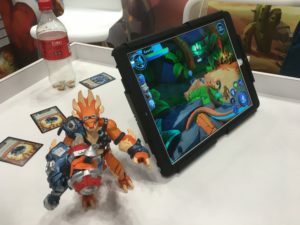 PlayFusion developed the accompanying app for Android, iOS and Amazon Fire mobile devices, Aaron DiStefano, Tomy senior brand manager for the Lightseekers product line, told us. The app game and an accompanying trading card game will launch April 17 and, starting July 1, Toys “R” Us will exclusively carry the two packaged starter packs, each including one toy action figure and five cards at $69.99 each and separate weapons and accessories packs at $14.99 each, he said. Other retailers will start carrying the line Oct. 1, he told us. 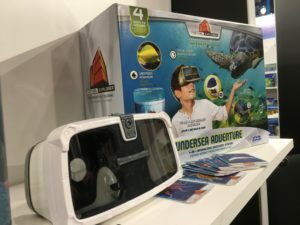 Educational toy maker Uncle Milton introduced its first three products using VR for the 2016 holiday season: Antopia Adventure and Prehistoric Safari at $34.99 each and Space Expedition at $49.99, all part of a new Virtual Explorer product line that also incorporates AR. On tap next for the line is Undersea Adventure this fall, Ken Malouf, VP-marketing and product management, told us. It will cost $49.99 and include an aquarium and VR goggles. 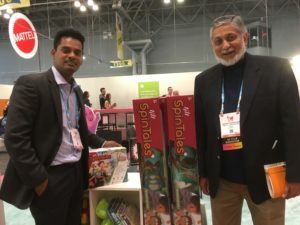 The products each combine technology with learning opportunities for kids because that’s what parents want in toys for their kids, he said. Antopia Adventure, for example, functions as a traditional ant farm. Although the ants aren’t included in the box, Uncle Milton ships buyers the ants for just a $3-$5 shipping fee, depending on where the consumer lives, he said. 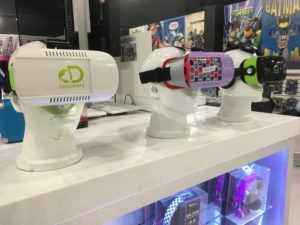 Like most of the AR and VR products we saw at Toy Fair, the product line is compatible with Android and iOS smartphones, which are inserted inside the goggles. Uncle Milton dabbled a bit in AR prior to the Virtual Explorer line, but the technology wasn’t a central part of the experience in those prior efforts, he said, adding Virtual Explorer marks its first full-blown product launches where AR plays a central role. The product line is being sold by retailers including Amazon and Toys “R” Us, and Best Buy is carrying only Prehistoric Safari for now, he said. But Uncle Milton is working to increase distribution of the line, which will expand with new SKUs, he told us. Unlimited Reality started in Israel three years ago and its first product was the AR board game Kazooloo, which it sold about 250,000 units of, mostly in the U.K., Niv Borenstein, CMO and one of the company’s four founders, told us at Toy Fair. 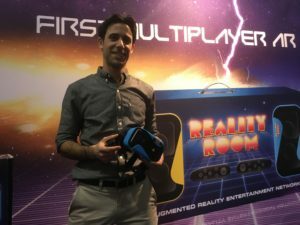 It started developing Reality Room, an AR entertainment network, about 6-8 months ago, and plans to launch it in August or September with about 10 games, he said. Included in a package for retail, at $49.99, will be two AR multiplayer headsets compatible with Android and iOS smartphones, along with two Bluetooth remotes. AR is a better technology to focus on than VR, “especially for kids,” Nir Gorali, COO and another company founder, said, predicting AR and VR will eventually merge into mixed reality. That, he said, is pretty much already happening now.